It was 1973. I was a high school junior. I was scared to death. Somewhere in the course of the school year, for some reason that I can no longer recall, I had signed up to join the “American Field Service” program. I had signed up so that I could become an exchange student and travel somewhere abroad. I had filled out all the paperwork, signed all the forms, gone through all of the interviews. I was ready to travel. To Germany. Or Austria. Or maybe to Wales. I imagined myself chatting comfortably with English speaking people in beautiful European settings. I imagined just enough quaintness to feel as if I was somewhere “away”. I never envisioned myself living on the edge of the Sahara dessert, under a red African sky, listening to the call of the muezzin as the sun set into the dusty hills. But that is just where I found myself in June of 1973. In the dusty Tunisian city of Kairouan, surrounded by the 3,500 year old walls of the ancient Medina. The air smelled of jasmine and heat and spice. It was so dry that it seemed to crackle, and I felt the sun like a pressured weight on the skin of my neck. I hadn’t even known that the world could feel so foreign. Nothing was familiar. I had met my Tunisian sisters, young women who were beautiful, graceful, charming and totally foreign to me. They all spoke English, but it was the musical sounds of French and Arabic that were swirling around me as I tried to make sense of my new surroundings. I knew that they were all trying hard to make me feel welcome, but I remember that on that first afternoon, I was overwhelmed by a feeling of strangeness and confusion. The whole world seem a bit surreal to me at that moment, filled with dangers and enticements that I had never imagined. I met my Tunisian mother, a quiet, smiling woman whose kindness did nothing to alleviate my sense of dislocation. I felt as if I had traveled all the way around the earth, leaving behind my sense of belonging, my sense of the rightness of the physical world around me. I felt a little bit lost that first afternoon, sitting on the little balcony of the family apartment, desperately trying to understand the conversations of the family. Desperately trying not to miss my own home, my own familiar family. Suddenly I heard a man’s voice, calling loudly and somewhat forcefully, “Ou est ma nouvelle fille! ?” (“Where is my new daughter?”) I remember feeling suddenly embarrassed, inadequate. And supremely out of place. Then he was there, Papa Barrack, smiling broadly and warmly, without even a trace of awkwardness. He wore a white robe and black plastic sandals. He was not tall, but he was a force. His personality filled the room, embraced us all, pulled me in. From that moment, I never doubted that I was a member of that wonderful family. Papa Barrak made it so, and it was so. Over the course of the three months when I lived with the Barrak family in Tunisia, I learned many, many things. I learned a lot of French and bit of Arabic. I learned about a new culture, and new foods and new music. I learned how to dance to that music, how to make my hips move independently of my shoulders and my feet in time to my hips. 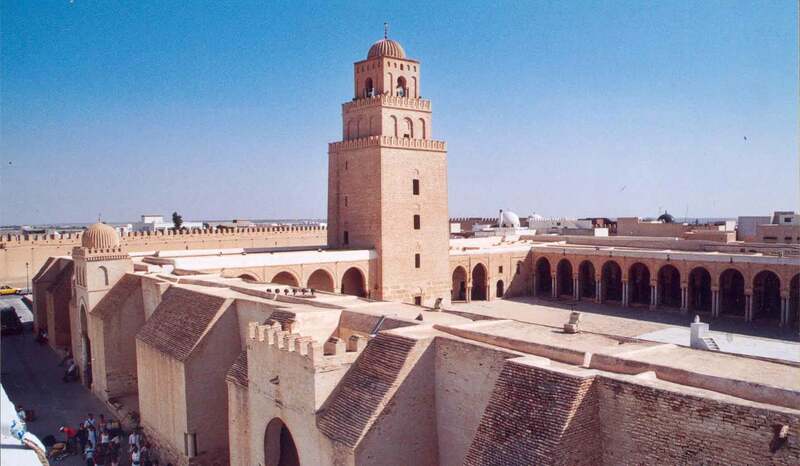 I learned how to cook and eat couscous, I learned about the mosques and about the beautifully haunting call to prayer. Most of all, though, in that wonderful summer of ruins and Carthage and French pop music and skinny dipping in the Mediterranean, most of all, I learned that people are just people. I learned that a Moslem Dad in North Africa and an Italian Catholic Dad in Massachusetts had more in common than anyone could ever have described to me. I learned that Dads of teenaged girls are proud and loving and protective and annoying and wonderful. I learned that Mom’s living across the globe from each other faced the very same trials, and the same pleasures. They shopped, they cooked dinner, they beamed when the kids ate what they had cooked. They wanted more help around the house, but they understood when it wasn’t forthcoming. I learned that kids are just kids, that families are just families, complete with love and arguments and annoyances. From Papa Barrak, I learned that when someone is there to greet you, you can be at home wherever you find yourself. Even at the edge of the dessert, in a land that smells of jasmine and heat and spice. Adieu, Papa Barrak. Repose en paix. What a beautiful tribute and a wonderful experience for young Moms. He was so much like my own Dad, so much. Wow, did this bring back memories. Is there anything more haunting than the muezzin at twilight? Okay, they use recordings mostly these days, but it’s still haunting and I can do a pretty good imitation of the muezzin. And the desert has its own beauties, though it took me a while to discover it, so different than the green and gaudy northeast. I miss it, though it has been more than 30 years … Thank for this beautiful piece. So true! I remember the smell of the air in Tunisia; I remember how dry it was and how I missed the green. But when I got home, I spent weeks feeling absolutely suffocated by the dense, wet, green all around me. Lovely post. We all have so much in common if only we got to spend time together. What a fantastic experience you had and I’m sure it went a long way to make you who you are today. Its a lesson that I hope informs all of my interactions now, and helps me connect to my students. It was the most wonderful and powerful experience of my life. Imagine if you hadn’t signed up? How our lives could be so different with just a minor change. What an amazing experience this must have been for you! I have done some travelling & I couldn’t agree with you more. “People are just people” no matter where we journey to. We all want the same things essentially, it is something I too, have learned from the places I have had the privilege of visiting. Thank you for sharing this lovely post. Thank you for reading! Where have you been, Lynn? I loved my brief adventure in Tunisia, but haven’t been lucky enough to do much traveling since. The lesson, though, have really stayed with me, as has my connection to my Tunisian family. I actually have 3 girlfriends that I started travelling with a number of years ago. Every couple of years we try to do a trip somewhere together. At some point I plan to write about our adventures on my blog but just haven’t gotten to it yet! We have travelled together to Italy, France, Greece, Spain & Portugal. This spring we are planning an adventure to Morocco! It is a marvelous & economic way to travel:) We develop our own itinerary, traditionally landing in a major city, seeing the sights & then venture out as we are not interested in touristy things:) Other travels with my husband &/or friends include Alaska, East & West Coast of Canada, Vermont/New Hampshire/Maine, NYC, St. Lucia, Antigua & Mexico. I love to travel…can you tell???? RIP to an obviously great man. So happy you got to be part of his family! This post made me cry! He was so sweet; so much like my own Dad. I was so lucky to know all of them…..